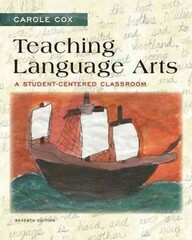 Teaching Language Arts: A Student-Centered Classroom 7 Edition This book brings the vision of a student-centered classroom to life through clear illustrations of guiding principles, balanced with examples of real teachers in real classrooms with real children, many of whom are English learners. Engaging, readable, and practical, Teaching Language Arts is built on a strong theoretical and research base, and illustrated and clarified with real-life examples of children and teachers from today’s diverse classrooms. Written to reflect cutting-edge theory, new research, the latest policies, the new Common Core State Standards, and best practices in the rapidly changing world of language arts instruction, the book uses a number of practical aids to bring the concepts alive, among them the unique, highly popular “Snapshots” of real teachers and students, which demonstrate the many skills required to become an effective teacher in today’s challenging and diverse classrooms.